Electro is a term that falls in and out of fashion. In the mid Noughties it’s a kind of dance music. But in the early 1980s – in Britain at least – it referred to bands whose music which was often songs, rather than instrumentals, was made mostly with synthesisers. The artists often had connections to the New Romantics and the post-punks; since it developed from both of those and the dark overtones of the lyrics forged a connection with the emerging Goth scene. But it was the use of electronic keyboards as the main instruments that set it apart. A lot of the inspiration came from the albums David Bowie had recorded in Berlin – Low and Heroes – with their mechanical sense of isolation. But they merely offered the blueprint for the start of the style, which would grow a lot bigger. The Essex poster boys of electro really came together in 1980, recording for the Mute label. Although they began having hits immediately, especially with their second single, Just Can’t Get Enough, there were problems in the ranks, and one of the keyboard players, Vince Clarke, quit, unable to handle the pressure of success. 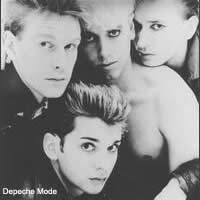 Very quickly their material turned darker behind singer Dave Gahan’s voice, as they consolidated their success, first in the U.K., then in Europe. College radio in the U.S. began picking up on them in 1984, and they soon found themselves stars there, too, appealing to a generation of disaffected youth in the time before grunge. They played to sellout audiences around the world, with albums going platinum, and their star continued to rise well into the 1990s. By this time, however, their sound had developed far beyond its electro origins. Until 2000 they remained one of the world’s biggest live bands, surviving personnel changes and a near-fatal heroin overdose from Gahan. The Human League, from Sheffield, first released a single in the early, heady days of punk – an oddity in that it used synthesisers, not guitars. But, after a few changes of members, they re-emerged in the 1980s with hits like Don’t You Want Me and Love Action that were definitely electro, but also remarkably poppy. By the middle of the decade, however, in spite of a few more minor hits, including Human, their popularity had declined. They persisted, though, and came back briefly in 1994 with Tell Me When. Since then, however, their success has largely been limited to 80s revival shows. There were plenty of others in the electro league, some leaning to the pop end of the spectrum, others more experimental. OMD (or Orchestral Manoeuvres in the Dark) managed a couple of hits before fading back into obscurity. Heaven 17, formed by two former members of the Human League, enjoyed hit singles with their synth-funk, but were unable to progress beyond that. Clock DVA (yet another Human League offshoot) was far more cerebral, and never bothered the charts at all. Vince Clarke, fleeing Depeche Mode because of its success, ironically found himself a hit again with his new duo, Yazoo, then later as one of the founders of Erasure – a man with the golden touch who never really wanted it. In many ways, electro set the template not only for dance music in the first half of the 1980s, but the rave revolution that would follow in 1988, and through that, much of the music that has evolved in all the time since.